In agricultural fields or in nursery or even in house hold growing grass is commonly found problem. Removal of the grass is also a tedious job involving lot of human efforts. In the modern world as time for carrying out any thing has reduced drastically so as to be done the removal of grass involving use of a machine. This machine can be called as grass cutter. Depending on its variants it can be termed differently like solar powered battery powered etc. In its simple construction a very high speed motor is connected to an end of a holding rod that is hang with a shoulder and held with hand to the free end of this rod a battery pack is attached. Also a solar panel can be attached to charge the batteries there by making the grass cutter run with the help of solar energy. The cutter used is actually a flexible wire that cuts the grass with high speed rotation. The high speed rotation of the blades along with the centrifugal force acted on it due to its minimal weight enable the flexible plastic wires cut the grass easily despite being not any hard and sharp material which is generally associated with any cutting blades. This project is constructed using an electrical motor, battery pack, cutting assembly, supporter rod, etc. 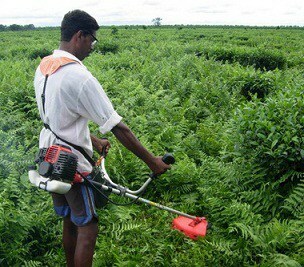 In our project we are using the multi agricultural cutter for cutting the crops, sugarcane, wooden materials and etc. It consists of simple manner and the used components are motor and rotating disc arrangement. Here the motor is working using with the help of electric power supply; on the motor shaft we have fixing the arrangement of rotating disc. The rotating disc arrangements are running like a cam. The cutters are fixed on the top of the ram arrangements. When we switch ON the machine the motor start to rotate the cam arrangements which is shown in the figure. Here the rotary motion is converted in to the linear motion by using simple mechanisms.